Once the zucchini is spiralized, put it on paper towels to soak up the excess water. The avocado paste: In a food processor, add avocados, basil leaves, garlic, pine nuts, lemon juice, and sea salt and pulse until finely chopped. Then, add the olive oil and blend until it has a creamy consistency. In a pan, put a little olive oil and add the zucchini. Cook for about 1 to 2 minutes until tender. 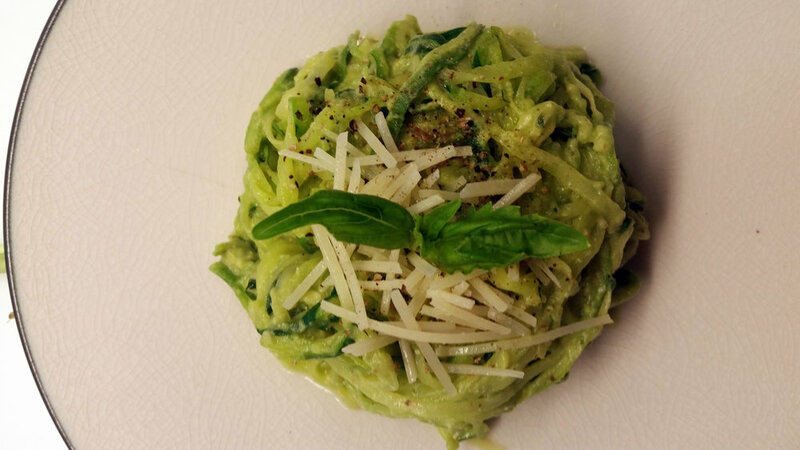 Add zucchini noodles to a large bowl and add the avocado pesto. You can season it with salt and pepper and a little parmesan. I like to use walnuts instead of pine nuts sometimes. You should always play around with the recipe and enjoy it.